Ahhh, another one of those "Solid as the Rock of Gibraltar" Philco Bakelite radios! 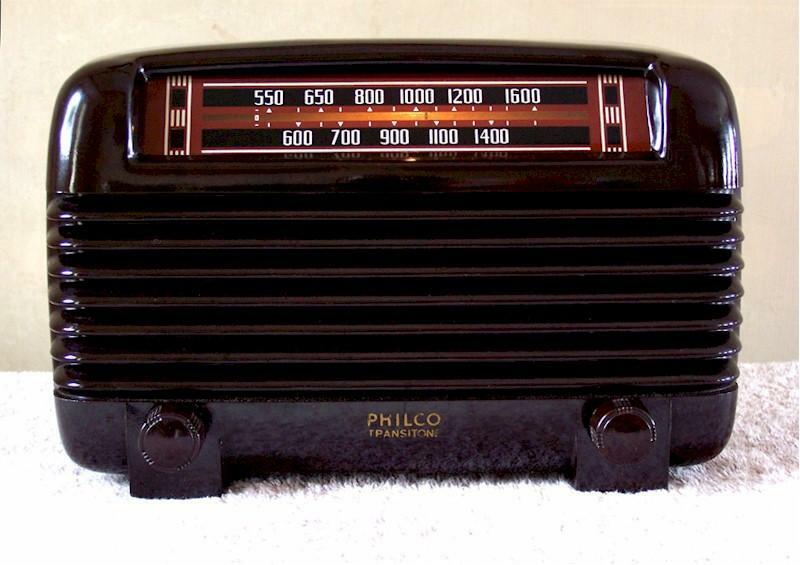 Of all U.S. manufacturers in my opinion Philco made some of the most durable - built to stand the test of time. This brown, heavily-swirled Bakelite beauty is no exception. Plays as good as it looks! Electronically restored and tubes checked A-O-K! It has a new power cord and laser cut back, too. Tube layout on the bottom is in great shape! Yep, it's an ol' "Jim Dennis Scale of Beauty" keeper! If you'd like additional pics please let me know. You are visitor number 3,429 to this page.